This quilt has been a long time coming. 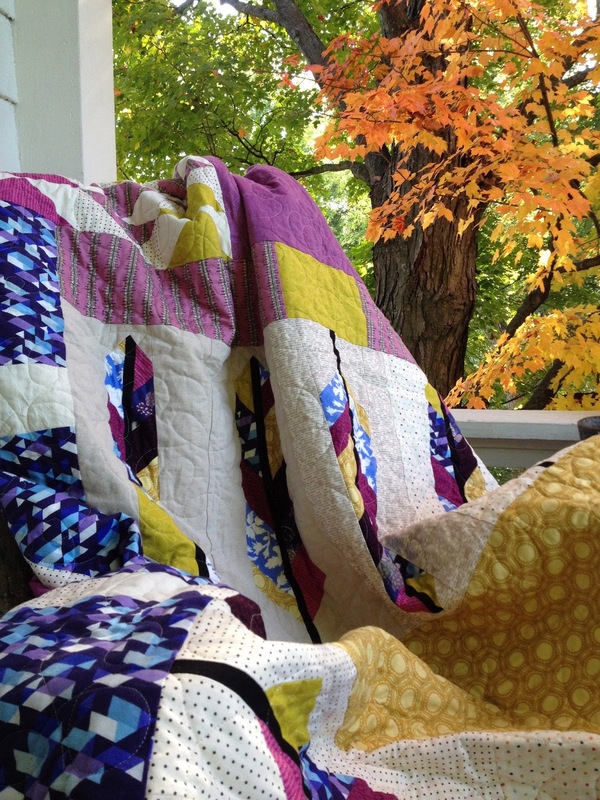 Back when my husband and I got married, my dearest friend from my high school days gifted us with a beautiful, bed-size quilt. 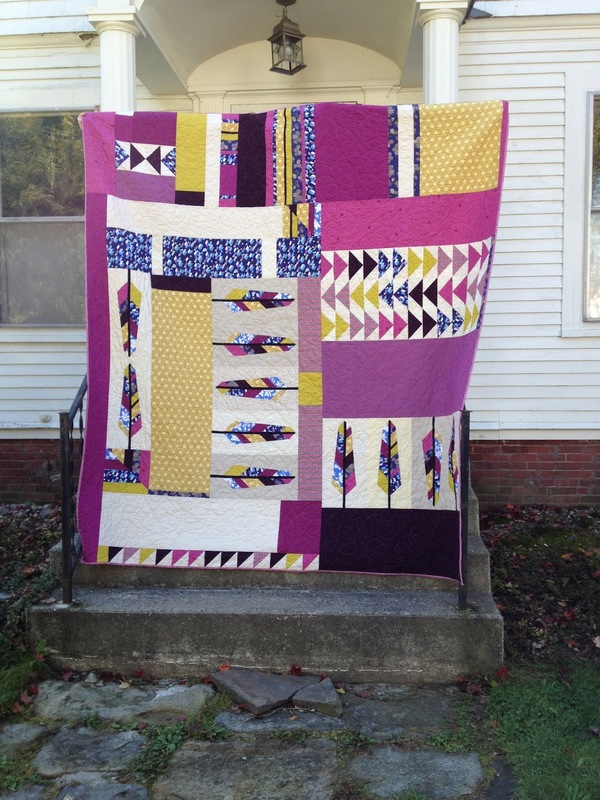 So when she got married in New York City last summer, I knew it was my chance to return the favor and make her and her new husband a quilt. A few months ago, a friend commissioned me to make a wedding gift for her friend, Annette. The gift was a pillow featuring Annette's wedding invitation, which had been brilliantly printed on a handkerchief. Using fabrics that my friend had selected, I sewed together a button-back cover (this tutorial came in very handy) to fit over a fourteen-by-fourteen-inch pillow form. Since my machine is ancient, I borrowed a friend's machine to make the buttonholes. I sewed the handkerchief to the pillowcase by hand, using embroidery floss that matched the yellow stitching around the edges of the handkerchief. I also embellished a few of the invitation's pink and purple flowers, using isolated chain stitches (my favorite part!). It was fun doing a commissioned project, and after spending so much time with the invitation, I loved seeing pictures of the actual event--Annette's amazing-looking and craft-filled wedding (which can be seen here). A few weekends ago, the husband and I flew into Las Vegas and drove out to the Grand Canyon to attend the wedding of two of our friends. The wedding was lovely (the Grand Canyon is a pretty spectacular backdrop for a wedding ceremony), and when we returned, I finished making the couple's wedding gift, which I gave to them this past weekend. Using Red Pepper Quilts' tutorial for an Hourglass Quilt (this is the second quilt I've made using one of her tutorials; here's the first), I created a lap quilt from scrap, thrifted, and new fabric. I decided to stick with a blue palette, which is both my favorite color for quilts and the couple's wedding color. After about an hour of standing in the fabric store, holding the quilt top up against all of the cotton fabrics I could find, I eventually decided on a muslin for the back. The quilt is tied with navy pearl cotton and bound with navy bias tape. On the back, I embroidered the couple's name and wedding date, and included a Salty Oat button. So as a recent gift to them, I decided to cross-stitch their phrase and frame it. The colors for the stitched phrase were loosely based on the colors of the original button, and the lettering was taken from my trusty booklet of cross-stitch alphabets. The frame is an inexpensive one from Ikea that I painted black.